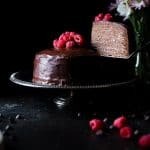 Just wanted to let you know that this deliciously dairy-free cake is sponsored by my friends over at Enjoy Life Foods! 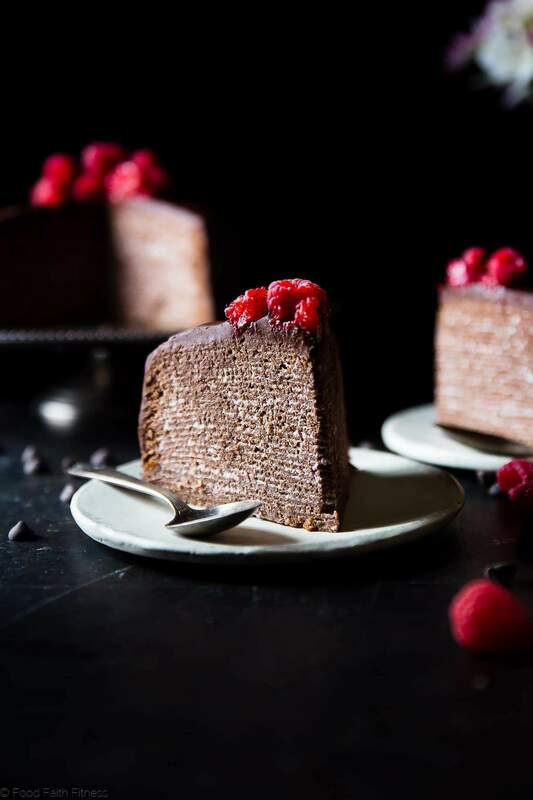 This chocolate vegan crepe cake is layered with raspberries and creamy coconut! It’s an impressive healthier, gluten and dairy free dessert that everyone will love! Making a cake out of crepes is basically the best idea you’ve EVER had in the sense that it makes CAKE for BREAKFAST 100% acceptable. And, yes, I AM giving you the credit for this idea since I know that smart person you IS going to take me up on this. I just SENSE a tower of tender, chewy crepes layerd with the CREAMIEST, fruitiest and lightly sweet raspberry filling, and SLATHERED with a coating of rich, deep, dark chocolate in your VERY near breakfast-or-brunch future. Yep. Knew you were going to take me up on it. If you’ve been around our little space of the internet for, liiiike, 3 seconds you’ll know that I am obsessed with cake-i-fying crepes. We’ve had them in the form of a paleo crepes cake with lemon strawberry coconut cream, a crepe cake with baileys coffee creamer chocolate ganache, a crepe cake with pistachios and coconut cream cheese frosting A-N-D a pumpkin spice latte vegan crepe cake. Cake + breakfast + crepes = Can’t stop. Won’t stop. Aaaaaand I’m guessing you’re just fine with that. Considering the whole “eat cake for breakfast and feel good about all things LIFE” shenanigans that this obsession is bringing to your cake-loving-soul. I usually don’t play food favorites, but I need to be SUPER honest with you for a second: T-H-I-S crepe cake is my favorite. 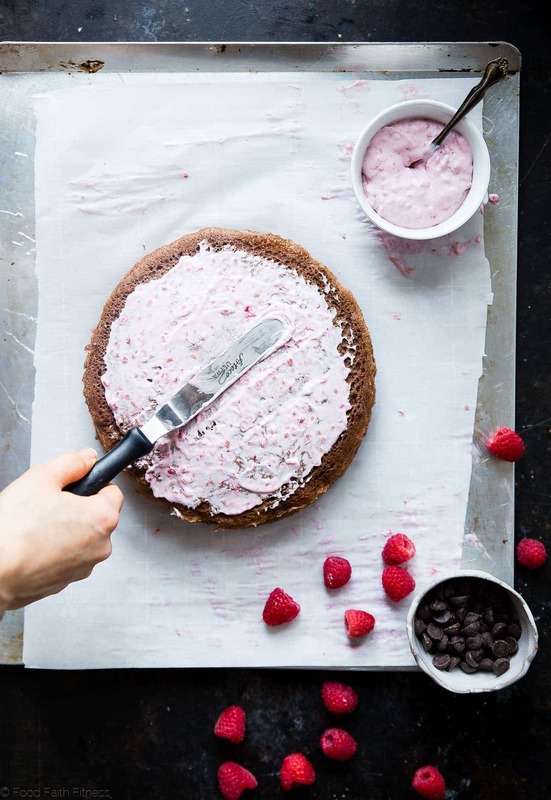 Partially because rich, velvety smooth chocolate + tangy bursts of lightly-sweet raspberries mish-mashing with CREAMY coconut whip in EVERY.SINGLE.BITE. <– Ob.Sessed. But, mostly because Enjoy Life Foods Pancake and Waffle mix is basically SAVING the day. This delicious little mix is doing ALL the hard work for you. No need to measure flour. No need to add whatever other ingredients you add into the batter to make it magically turn into a crepe. Simply add water, cocoa powder, sugar and a touch of oil and – PRESTO – magical crepes happening in your very real life. 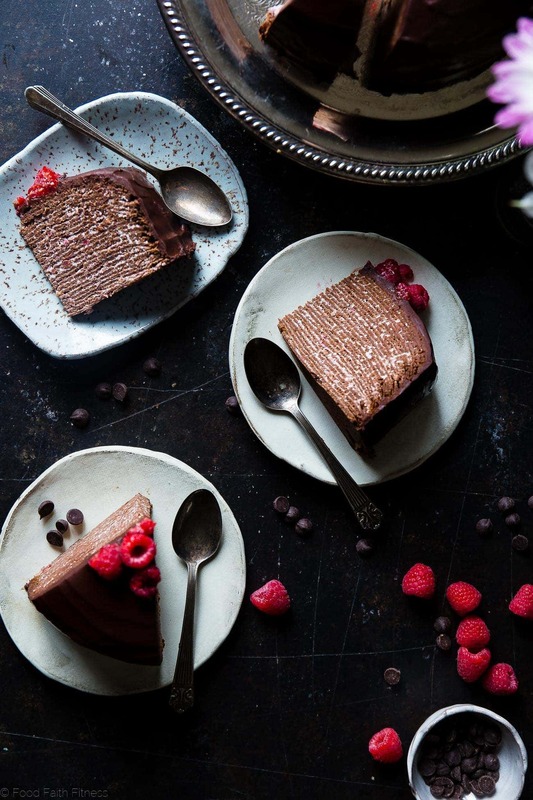 May is Celiac Awareness month, which is ALSO why we’re celebrating all our gluten free friends with CAKE ,– Would you want to go to a party without cake? 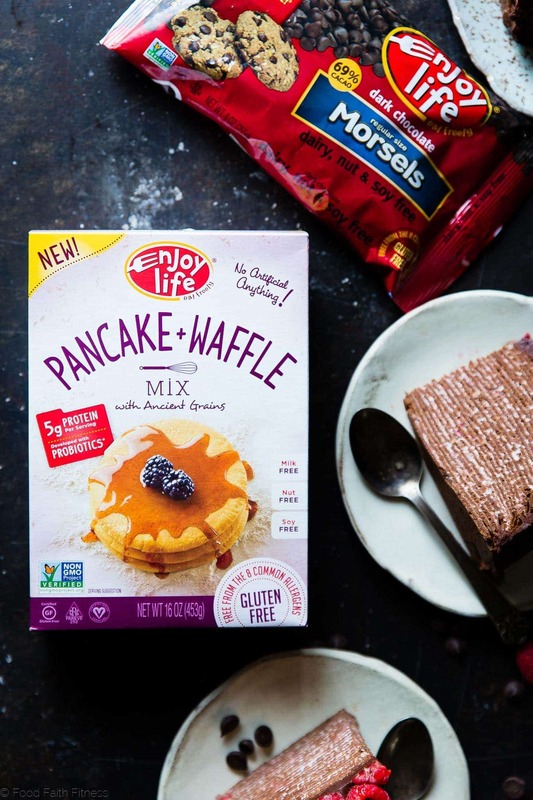 Just like the skillet peppermint vegan brownie, and dairy free vegan chocolate truffles where I introduced you to Enjoy Life Food’s baking mixes, this mix (and their chocolate!) is free from allergens, but DEFINITELY not free from taste. 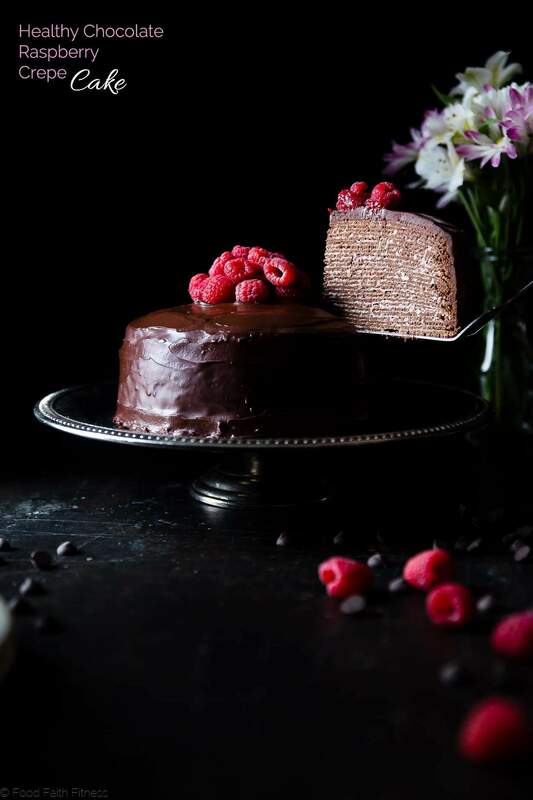 I obviously haven’t met your mom, but I think there is a general consensus among all people who love food (moms are included in that category) that chocolate and raspberries and cake is a VRY VRY delicious combo, and is the perfect way to celebrate for all events of LIFE. I feel like your momma also doesn’t usually play favorites. But, let’s have some real talk for a second. If you presented THIS crepe cake to your Momma? You would DEFINITELY be the favorite child. 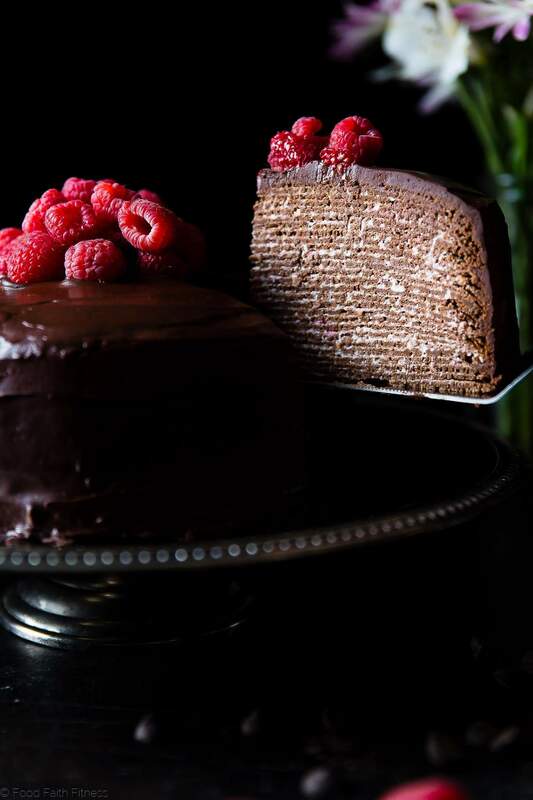 These crepe cake is made of chocolate crepes layered with raspberries and creamy coconut! It's an impressive healthier, gluten and dairy free dessert that everyone will love! Total time does not include chilling - please read full recipe and notes carefully before making! Combine all the "cake" ingredients in a blender and blend until smooth. Lightly rub a good quality non-stick 10 inch pan with melted coconut oil * and heat for 3 minutes on medium heat. Use a scant 1/3 cup (don't quite fill a 1/3 cup liquid measure) of the batter and pour onto the pan, moving the pan in a circular motion while you pour, so the batter coats the entire thing thinly. Cook until the edges of the crepe crisp up and pull away from the sides, and the top looks set, about 1 min 30 seconds (they will cook quicker as times goes on and the pan heats up), very gently flip and cook for an additional 20-40 seconds on the other side. Transfer to a parchment paper-lined plate and place into the refrigerator so they cool. Repeat until all the batter is gone, lightly rubbing the pan with melted coconut oil between EVERY SINGLE crepe. You should end up with 26 crepes. While the crepes are cooking, whisk together the coconut milk and honey in a medium pan over medium heat. Cook until the milk JUST begins to steam and small bubbles form in the surface, making sure you don't let it boil. Remove from heat and add the chopped chocolate in - don't stir yet! Let the chocolate sit on the milk for 30 seconds and then whisk until smooth and combined. Pour into a medium bowl and refrigerate so it firms up while you keep making the crepes. Once the crepes are cooked, scoop just the coconut cream** out from the can (throw away the water in the bottom of the can) and add in the raspberries and honey. Use an electric hand mixer to blend the raspberries into the cream until broken down and well mixed. You should end up with about 2 1/2 cups. Line a baking sheet with parchment paper and place one crepe on it. Place a lightly heaping Tbsp of cream on the crepe and spread it out thinly (an offset spatula will help a lot!) Repeat until you've done all the crepes. Pick off any crunchy or large sides of the crepes and then refrigerate for 30 mins to set the cream. By this time, your ganache has probably hardened. Put in the microwave for just a few seconds (10-15) so it softens and is spreadable, but isn't runny. Scoop 1/2 cup onto the cake and spread all over (work quickly as it sets fast!) making sure to seal in all of the edges of the crepes - it doesn't need to be pretty. Place back into the refrigerator to set for 30-45 minutes until hardened. Microwave the remaining ganache until it's pour-able. Place the cake onto a wire-rack and set it over the baking sheet. Pour the ganache on top and smooth it over all the sides, using an offset spatula. Top with fresh raspberries and chill until the ganache is set, about 30 minutes. *You need to use a very good non-stick pan, or the crepes will just stick and not work. **The cream should be firm but soft - not hard like a rock. Note that Enjoy Life Food's Pancake and Waffle Mix and Chocolate Morsels are free from allergens. However, this recipe does have coconut products in it. I've not tested any swaps to make this particular crepe totally free of coconut. If you’re looking for another allergy friendly cake recipe, make sure to check out this Gluten Free Raspberry Buckle Dump Cake from Petite Allergy Treats! This is just stunning! I have never made a crepe cake and it’s definitely time to change that. Beautiful work as always! This looks delicious. Enjoy Life is seriously the best!! Thank you Lindsay! I love their stuff too! What a great idea! This looks wonderful! Pass me a slice or three! I can’t imagine how much love you put into this cake. It’s absolutely stunning Taylor. It definitely took some time and love 🙂 Thank you Emily! Looks delicious! I wonder if I can get the girls to make me this for breakfast for Mother’s Day? I think we have everything to make it too! I would try for sure 😉 Thanks Sarah! I can’t get over how gorgeous this is! Definitely a labor of love, but so worth it for this! Definitely worth it! 🙂 Thanks! You are the sweetest Maria! Thank you! Between the photos and the creative use of ingredients, I am so impressed! Wow! This crepe cake is stunning! I can’t believe something so chocolatey and indulgent could be vegan! So gorgeous! I have been thinking about crepe cakes lately after watching a demo of a nonvegan version so this is pretty heavenly! Bravo!! DO IT. They are SO fun to make! I think I’ve just found the most delicious looking thing on the internet! Wow! This cake is absolutely stunning! Love the flavors and unique way you put it together. That is just plain gorgeous. May I please have a slice?! You definitely can! 😉 Thanks! Ooooh! SO pretty! I’ve totally love if my kiddos got into the kitchen and made this. 😀 Pinned. Sharing. Love! Wow, what a gorgeous cake! I don’t know if I have the patience to make this myself, but you are right, whatever kid brings me this will definitely be the favorite that day!! Yum! LOVE Enjoy Life and this cake!! Wow!! Really stunning, beautiful job! This looks absolutely amazing. Definitely added to my must try list! Wow, what a positively decadent idea Taylor! This definitely lives up to the Eat Freely slogan! This is the most beautiful cake I have ever seen!! I am new to following a gluten free diet myself, so this makes me so happy to see that it is both gluten and dairy free. Thank you! I would be so thrilled if someone baked me this for Mother’s Day! Hope they do! Happy Mother’s Day! I can’t get over how gorgeous and perfect this looks!! I made this recipe for Kids Party. Wow! It was Very delicious and everyone LOVED it. I would totally eat cake for breakfast any day! 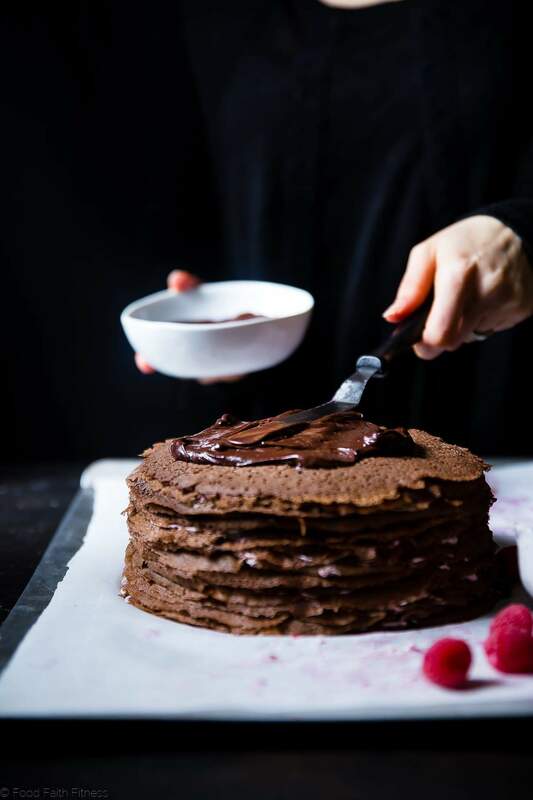 This crepe cake looks splendid, especially because it’s chocolatey and healthy! Well done! Shut the door, jaw is dropped and ready for a bite!!!!! Making this for the 4th, it has to be apart of the partaaayyy fo sho!!! Thank you for these great vegan options!!! Haha I LOVE it! Hope you love it! Happy 4th! This is just stunning! I’ll just have this for lunch. And that frosting has me totally intrigued. Love it. I like the idea of this for lunch! Haha! Thanks! Can you make this cake a day before or should it be made and served right away? You can totally make it the day before!